I sat down last night to shoot a couple of videos. As hard as it may be to believe, I used flexi floss for the first time ever. Despite having wanted to pick it up numerous times in the past, it’s just evaded me. To my surprise its rubber. All these years I thought it was floss! So here’s to discovering new materials and new flies. The “Flexi Dad” should be a winner. I actually have a video of this one up on youtube, but its too long and I left my fan running for the whole thing which makes it that much worse. I will try and get a better video up shortly. For now the pics will have to do. Oh yeah, I like this one! Weed guards on good flies = fish. This post will serve as both notice and resource to prospective buyers wanting to view product. Click here to enter the Dubbing Store. A course, translucent, sparkle material, great for adding body, highlight, sparkle and translucent qualities to a fly. The Article below was published in The New York Times and can be found at http://www.nytimes.com/2012/02/13/sports/carp-now-a-worthy-fly-rod-target-in-united-states.html?_r=1 . I take no credit for any of the writing or pictures. Will Rice caught a carp in the South Platte River in Colorado. Carp can grow to more than 4 feet and nearly 100 pounds. Fly-fish for carp? For many anglers, the first response might be, “Why?” For coldwater anglers, carp have long been the fodder of mean-spirited jokes, a species more likely to be pursued with a bow and arrow than a bead-head nymph. But the fly-fishing frame of mind regarding Cyprinus carpio is changing. Will Rice, an outdoors writer based in Denver, had his moment of “carptharsis” a number of years ago. “During the spring runoff, trout fishing in the Colorado Rockies is just not happening,” Rice said. “One May, a friend and I were eager to wet a line, so we headed east from Denver to fish a reservoir for wiper,” a striped bass and white bass hybrid. “We rented a boat and began zipping around,” he said. “At the edges, high water had pushed over the banks into some grass flats. We took a closer look and saw all these fish moving around — 10- to 12-pound fish — finning, mudding, even tailing. They were carp. We didn’t catch any that day, but it was eye-opening to see fish behaving like this — the way bonefish and permit behave. Carp are a species you can sight cast to with a fly rod without traveling to the Caribbean.” Comparisons to bonefish in terms of their skittishness and strength have earned carp the nickname golden ghost. Common carp are of the cyprinidae family, the largest group of freshwater fish. Distinguished by large, sometimes golden scales, barbells, a stout profile and a small mouth, carp can grow to more than four feet and nearly 100 pounds, though 2- to 3-foot specimens of 10 to 20 pounds are more commonly encountered in the United States. Aesthetically speaking, carp, which lack the streamlined shape and the delicate watercolor patterns of trout, are an acquired taste for some. This may be true among casual anglers, but many professionals know better. Ask guides on the finest trout streams in the American West what they do on their days off, and they will sheepishly admit that they chase carp. Carp are catholic feeders; they will feast on aquatic insects in all life stages, crayfish, baitfish — even plant matter, like blackberries. 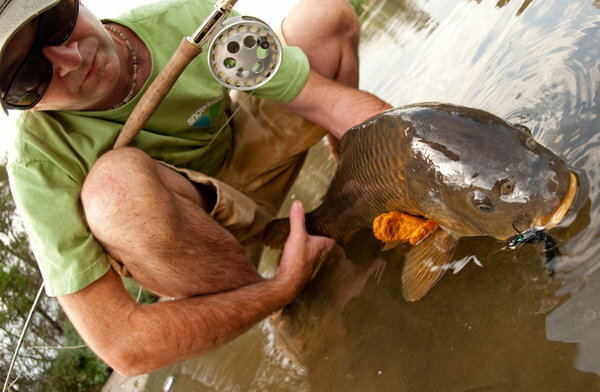 Anglers should not mistake the carp’s broad appetite as license for sloppy presentations. Carp possess highly developed senses of sight, hearing, smell and touch. This makes them spook easily. A spooked fish emits a pheromone that warns other nearby fish of potential danger. If you misfire and put one fish off, odds are good that any other fish in the immediate area will go off the bite as well. A version of this article appeared in print on February 13, 2012, on page D8 of the New York edition with the headline: Carp Gain as a Fly-Fishing Favorite.